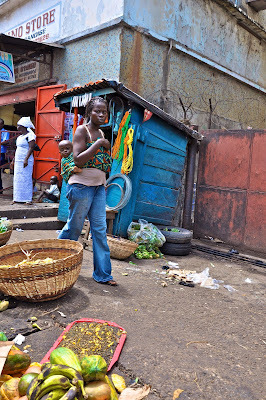 Nazareth House Apostolate Blog: Lenten Mission Trip: Sierra Leone, Day One. During our recent trip to Sierra Leone, we started our first day in Freetown in the usual way. James and Fr. Seraphim began their day sipping their favorite "Goatlip Tea"
with a leggy critter in the shower. 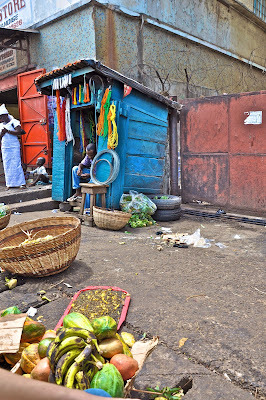 The colorful markets in Freetown are great and I love the people. The people are so friendly and eager to have fun. this particular lady asked me to take her picture. She said that she needed a husband and if I took her picture she would get one. 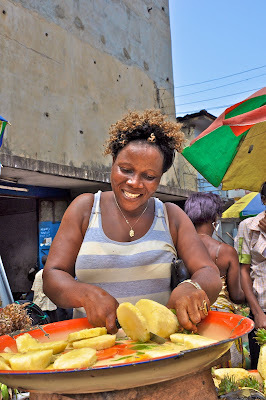 A good man would see her hard at work at the market and seek her out for marriage. So ...here is her picture, I hope her future husband is looking at this blog. She is definitely a hard worker and a lot of fun. "Take my picture, I need TWO husbands!" it was time to go get Roo from school. Roo's school is on top of a road that had a steep incline. An ice cream vender was struggling to push his cart to the top of the hill so that he could catch the children as they came out of school. I ran over to help him and was surprised at how heavy the cart was. Together we both struggled to get the cart to the top of the hill just in time for the school's release. Just as we get it to the top, here comes Emily and Kadijah with Roo and Jillian (Our neighbor, Maranda's little boy). Once we collected Roo, we went further into the city to pick up more supplies. and gave him a few leones to help him out.